Have everything about a project in one place, all together. Create a calculation or add important information. The module also works as a tracking tool to keep an eye on the progress of a project and related part-tasks. Thanks to the Projects module, you will always have a complete overview over what exactly are you doing for your customers with costs and profits. The Project module keeps a record of each business case and is functioning also as a summary of costs and profit. For a creation of a specific offer, a custom calculation for a client may be set in this module. This module contains also whole history of communication as well as tasks, all in a specific Project. 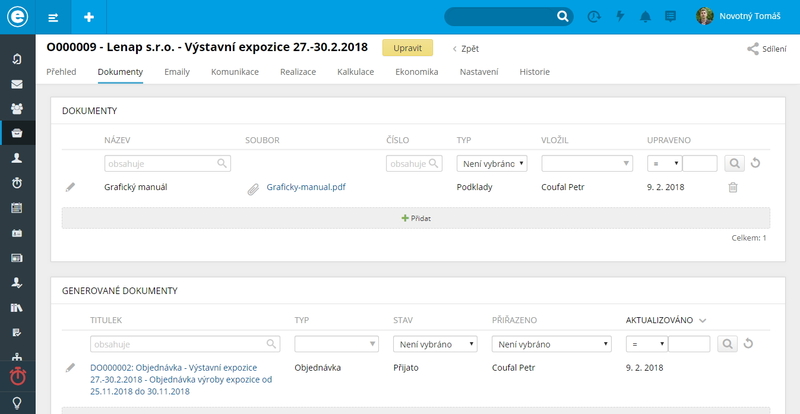 You may fill in addition information about a customer as well as track a project or part tasks connected to a client. Projects also contain settings for Timesheets. 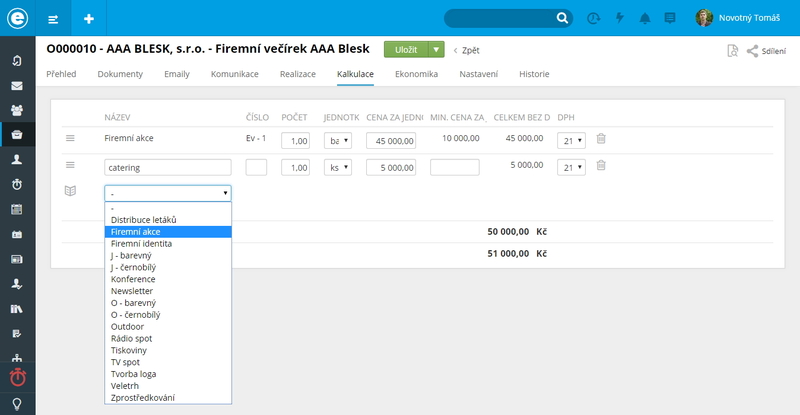 A price offer for a client may be easily made in the Projects module and then sent via eBRÁNA e-mail client. The calculation may be compiled from your own price list items with defined sales price (including VAT and its validity). Your items may be added to the price list as well. Such calculation may then be used to create an offer via eBRÁNA document generator. The project is managed by the Tasks module. Tasks are saved in a folder for a project they manage. Sales managers thus have organised list of the whole project realisation. Pin your favourite projects to your dashboard. Save all documents in a Project. The eBRANA system carries an incredible advantage of creating and saving documents. 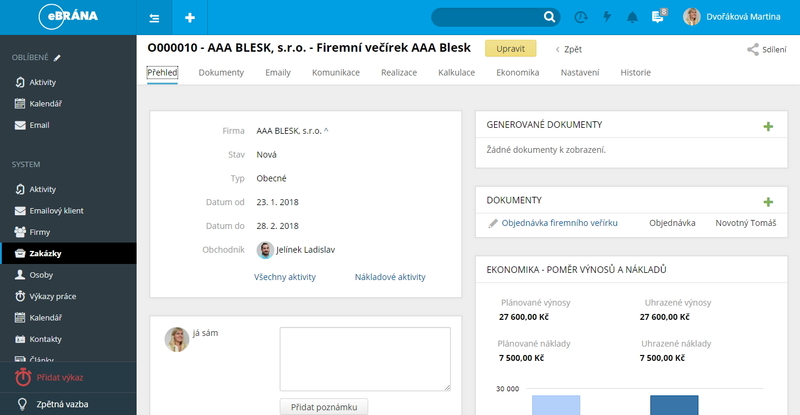 Documents from the eBRANA system will automatically save to a customer and his project. Should you have an document made in a different system, simply attach it with its registration number and description. Tracking your costs may be a difficult task. 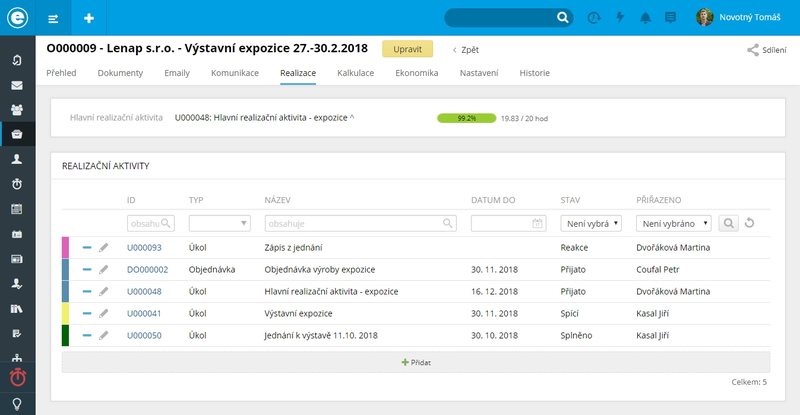 The Projects module is capable of tracking the costs for individual tasks and actions for a specific project. The module is also able to compare profits between multiple projects. Costs for a project are calculated either from your own materials or from automatically synced Timesheets. Profits, on the other hand, will be any financial resources received from your client, which may be used in the reimbursement plan. 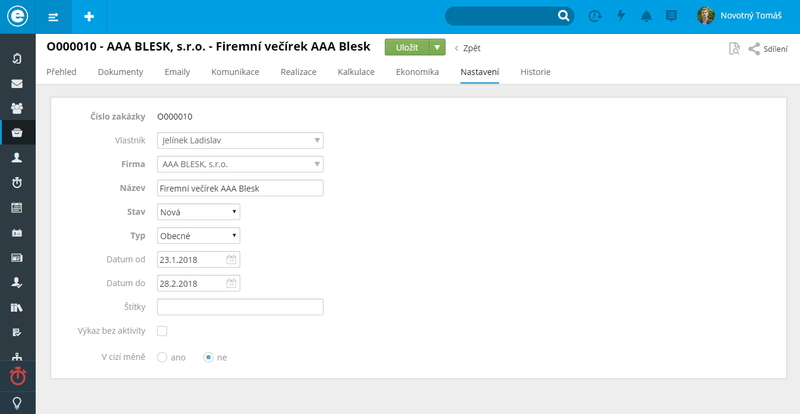 The Tasks module is used to record every work related activity. Business and project tasks are bound to a Project module entry for each client. Every user has an overview of his tasks in a chosen time horizon. 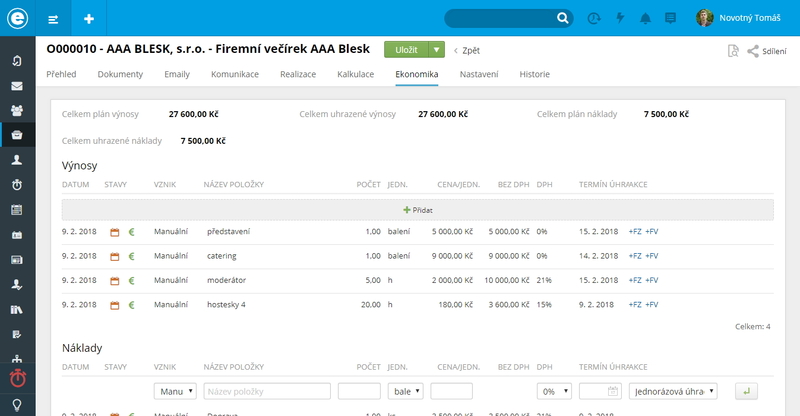 Thanks to the Accounts module, you will have all necessary information for business in one place.